This little cup fungus is so tiny that you are likely to miss it, unless you're on your hands and knees collecting some other, larger mushroom. To the naked eye there is not much to see: a dull orangish brown surface that's smaller than the nail on your little finger and, well, not much else. 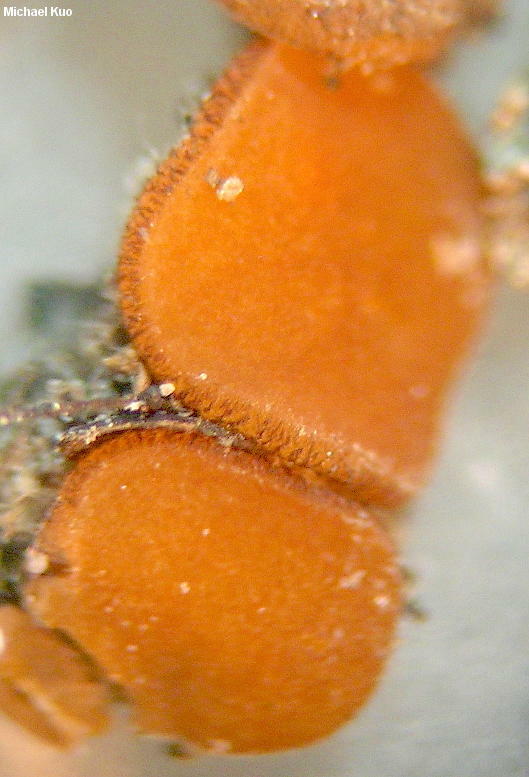 Use a hand lens, however, and Sphaerosporella brunnea is revealed as an "eyelash cup," like the better known (and larger) Scutellinia scutellata, with a fringe of tiny hairs around its margin. 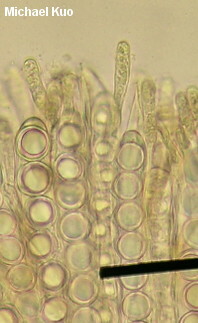 Under a microscope, Sphaerosporella brunnea gets even more interesting; it has perfectly round spores (rare for cup fungi) and the hairs are revealed as thick-walled, septate, and dark brown. 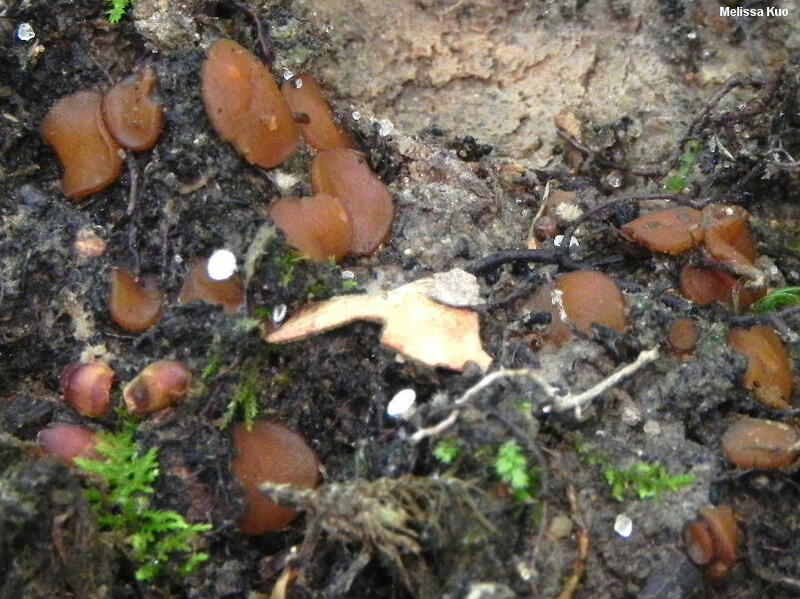 Traditionally, Sphaerosporella brunnea was separated from Sphaerosporella hinnulea on the basis of habitat, with the former species putatively dedicated to burned substrates and the latter species found in moss or moist soil. Additionally, some authors desginated brown to yellow-brown versions as Sphaerosporella brunnea, with orange-brown versions receiving the label Sphaerosporella hinnulea. But the most recent treatment to consider the question directly (Yao & Spooner, 1996) treats the two species as synonyms. 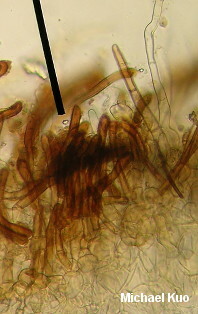 Sphaerospora brunnea and Sphaerospora hinnulea are synonyms, as is Trichophaea brunnea. Ecology: Mycorrhizal (at least facultatively) and perhaps saprobic; growing alone, gregariously, or in loose groups; often collected on burned substrates, but also found among mosses and on bare soil; spring through fall; apparently widely distributed in North America. The illustrated and described collection is from Illinois; it was made in mossy soil under white oak. 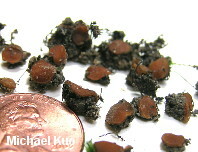 Fruiting Body: Cup-shaped when young, becoming saucer-shaped; 3-5 mm across; upper surface bald, orangish brown; margin with tiny tufts of brown hairs (use a hand lens or dissecting microscope); undersurface very finely hairy, colored like the upper surface; stem absent; attached to the substrate at a central location; odor and taste not distinctive; flesh orangish, fairly tough. Microscopic Features: Spores 12-15 µ; globose; uniguttulate and hyaline in KOH; hyaline in Melzer's. Asci eight-spored; tips not blue in Melzer's reagent. 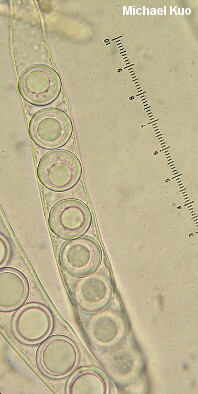 Paraphyses filiform with cylindric, gradually thickened, or subclavate apices 2-6 µ wide. Hairs brown in KOH; septate; up to 5 µ wide; each arising from a series of subglobose, wider elements. REFERENCES: (Albertini & Schweinitz, 1805) Svrček & Kubička, 1961. (Fries, 1822; Saccardo, 1889; Massee, 1895; Batra & Batra, 1963; Dennis, 1968; Breitenbach & Kränzlin, 1984; Danielson, 1984; Yao & Spooner, 1996; McNeil, 2006; Tedersoo, May & Smith, 2009; Beug, Bessette & Bessette, 2014.) Herb. Kuo 06091305.